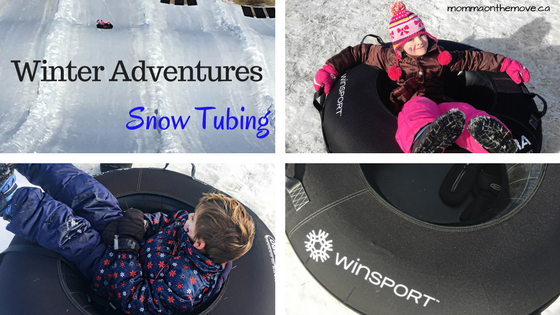 Snow Tubing is a fabulous outdoor winter activity that has taken many ski resorts by storm! 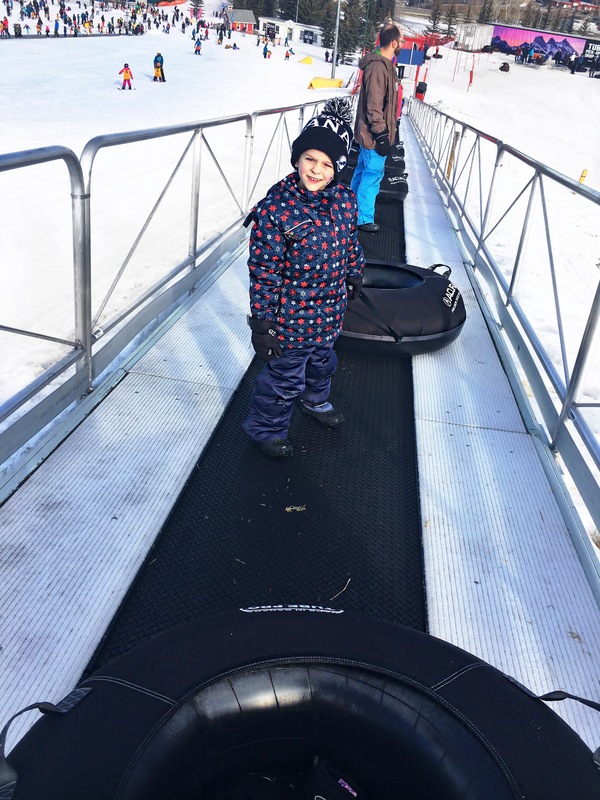 This exhilarating concept of cruising down the snow covered hill on an inner tube is not only fun but a great family activity. A secondary activity to the toboggan, snow tubing originated sometime back in the 1800’s. 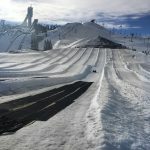 The concept of cruising down the hill in a tube slowly gained popularity over the years and really took off in the 1990’s when many ski hills decided to offer an alternate outdoor activity for the increased non skiers that were coming to the hill. And let me tell you snow tubing is an absolute rush! 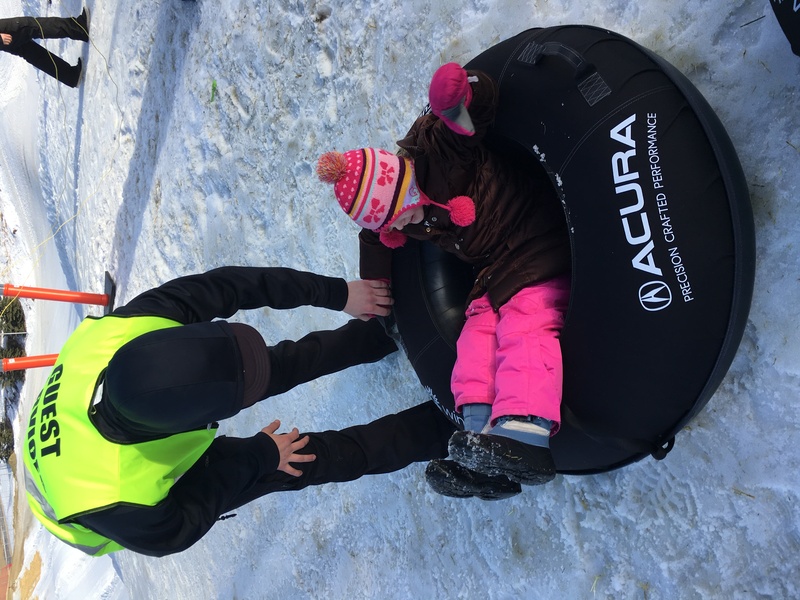 We had the pleasure of trying snow tubing for the first time at Winsport’s Acura Tube Park here in Calgary. Boasting 9 lanes and Western Canada’s largest tube park, it is quite different than hopping on the toboggan and zooming down the hill. 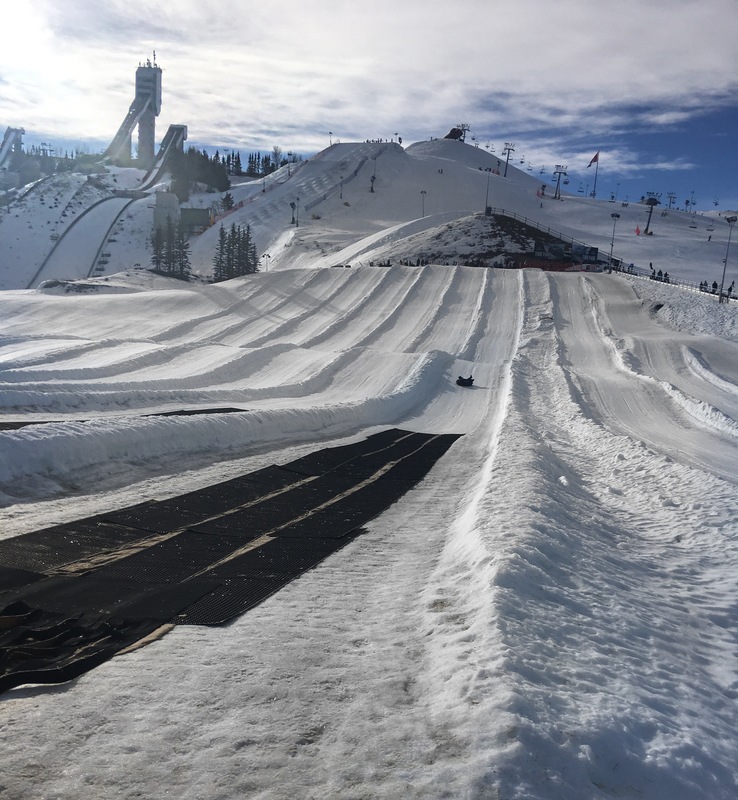 First off, it is safer as the tube park is set up with lanes, so when you go down the hill you have your own wide space to zip through. Plus it is staff supervised and they moderate when people go, making sure the lane is clear before the next person zooms down. Second, you can save those legs going up and down the hill with your tube each time because you ride the magic carpet to the top. This allows you to stop and enjoy the ride up as well. Third, the lanes are groomed and maintained. 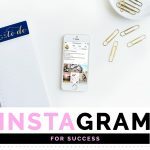 So though you may experience some dips and curves they are none of the bumps or bare spots that you might run into on the traditional toboggan hill. Easier on the tailbone and the rest of the body! The kids were super excited to give it a try. Children have to be at least 42″ to ride by themselves but children 36″ or more can go if they ride with an adult. Chloe was a little trepidatious but totally wanted to go by herself regardless. Luke, as he does, just watched everyone else go first, getting the lay of the land, seeing what to expect, and was quite confident to go on his own once it was his turn. When it’s your turn the staff actually give you a push and launch you down the lane. Either giving you a spin or sending you straight – which they ask you what you’d prefer before they do. Being a little cautious myself I asked for straight the first time I went, but honestly you want to spin! (Just remember to wait a minute or so when you get to the bottom cause you might be a little dizzy). It is so much more fun. Spinning and zooming safely down the hill really is exhilarating. I screamed every time and loved it! You can also go down in groups of up to 4, where each person is in their own tube but you are all holding onto another tube in your group. This can also be lots of fun and another way to share the experience. Passes for the park are quite reasonable, starting at 18.99 for youth and can be purchased in 2, 3 or 4 hour rides. You also have the ability to reload your cards at a reduced rate for future rides. And they currently have an unlimited Family Pass on sale for the rest of the season – we’ll definitely be getting one of those! The only downside is even though the park has 9 lanes it can get quite busy at the top and hard to determine which line for which lane you are in. Since they are newly opened, they are still working out some of the kinks in the running of the park so that it is smooth and efficient. But they are doing a great job! the staff are so fun and friendly and most people are pretty understanding about being patient and waiting their turn. 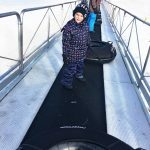 Snow tubing is a fabulous alternative to tobogganing and I feel a bit safer as it’s more controlled (you also don’t need to bring any equipment). And with the new bylaws here in Calgary only allowing toboganning on 22 designated hills it provides another great option for kids and families. I also love that it’s local! 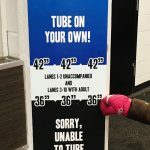 There are other snow tube parks in the mountains outside of Calgary like Norquay, Nakiska and Lake Louise but if you don’t want the addition of the longer drive then this is perfect! So zip down to WinSport and check it out before the season ends. 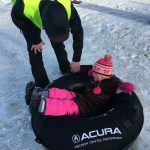 Want to experience Snow Tubing at the Acura Snow Tube Park for yourself? Check out their unlimited Family Pass currently on sale. The main street is lined with people, children and adults alike. Lights all aglow, shops closed and waiting in anticipation for what’s to come. Snow glitters on the sidewalks and the majestic mountains surround us. It’s beautiful. Excitement is in the air as children peek out from the crowd to look down the street to see if it’s begun. To see if Santa and his parade are coming. Waiting patiently, yet continually asking Mom and Dad if it’s time yet. 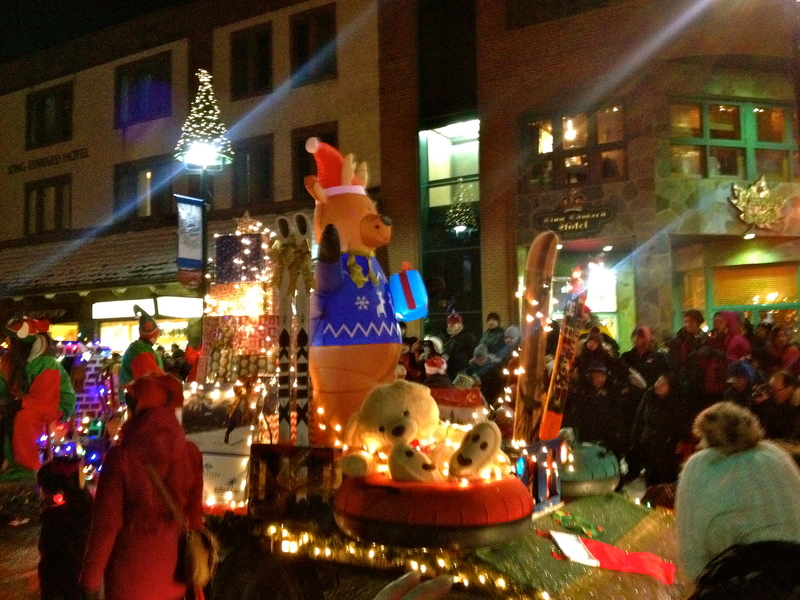 This is Banff’s annual Santa Claus parade, held at night with the beauty and magic of Christmas lights all around. We attended this beautiful event for the first time this year, and it is well worth the trip out to Banff. Currently run by Banff Lake Louise Tourism for the past 7 years, this event has been hosted by the Town of Banff for many years prior. 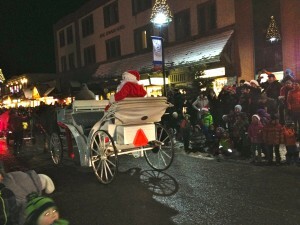 The parade itself is actually the finale of a day filled with kid friendly and family activities such as face painting, balloon twisting, Christmas carols and a visit and photo with Santa down at the train station. 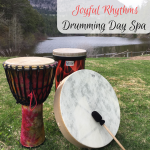 There’s also horse drawn wagon rides, tasty treats and of if you’re up for it, a nice soak in the hot springs (which is available every day of the year but is always lovely). 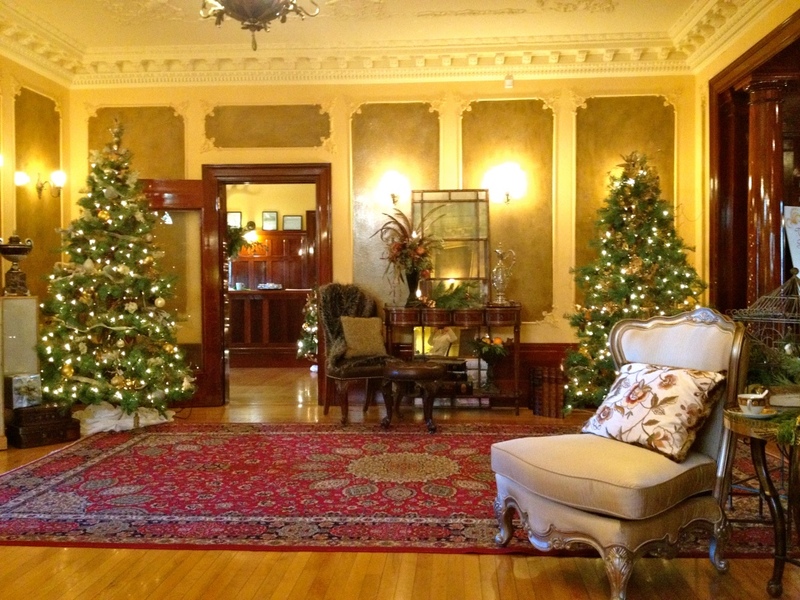 I love touring Banff Avenue and spending time in the Christmas Shoppe. 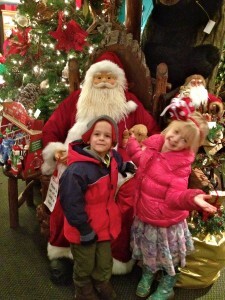 My youngest two, screaming in delight at the grand display of Christmas houses and towns. The ornaments are many, the options are delightful and there is no shortage of Christmas anywhere. The parade itself is only half an hour long, which I feel is the perfect length for children, who remain engaged and excited the whole time. The floats were gorgeous, creative and unique all lit up as they moved down the street. 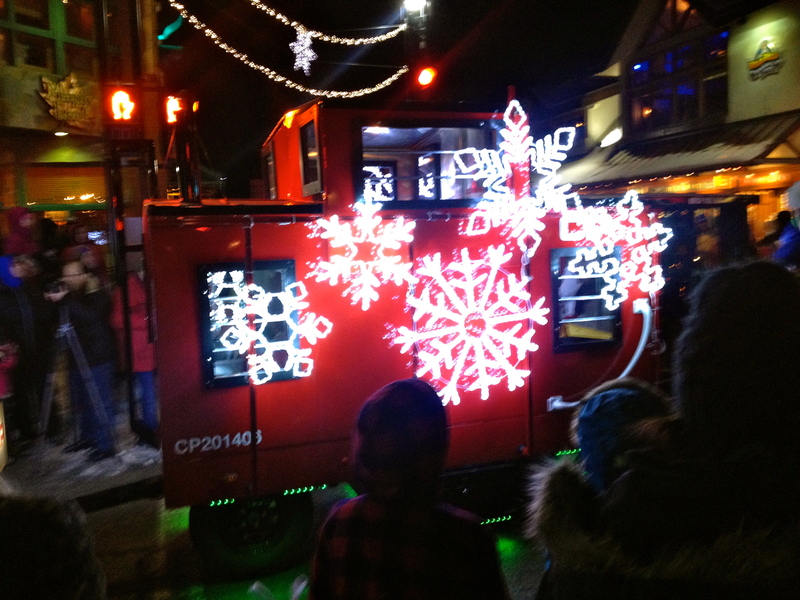 From the Girl Guides to Sunshine Village there was an excellent representation of the town. Of course I loved that it was at night. 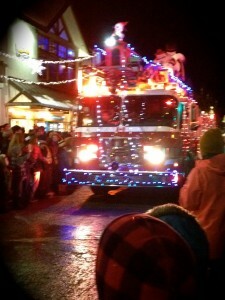 It just added to the atmosphere and excitement with all the floats magically lit up. Even my oldest son, who is 12 and I was unsure if he would like it, expressed that he did enjoy it and said it was “cool”, which meant we had success. I think Santa Claus parades are such a fabulous idea and up until recently only knew of the big ones in Toronto and New York. I didn’t realize that many of the local towns in and around Calgary host their own Santa Claus Parades and they are quite well done! Parades are held in High River, Okotoks, Airdrie, and Cochrane (which if you still want to attend a Santa Claus Parade this season is this Saturday, December 12th). I think it’s a great way to celebrate the season and your community. And everyone has that little flare and does things a little differently, distinguishing themselves from the rest. You can go to any of the town’s websites for details and pick the ones you want, or even do a tour! 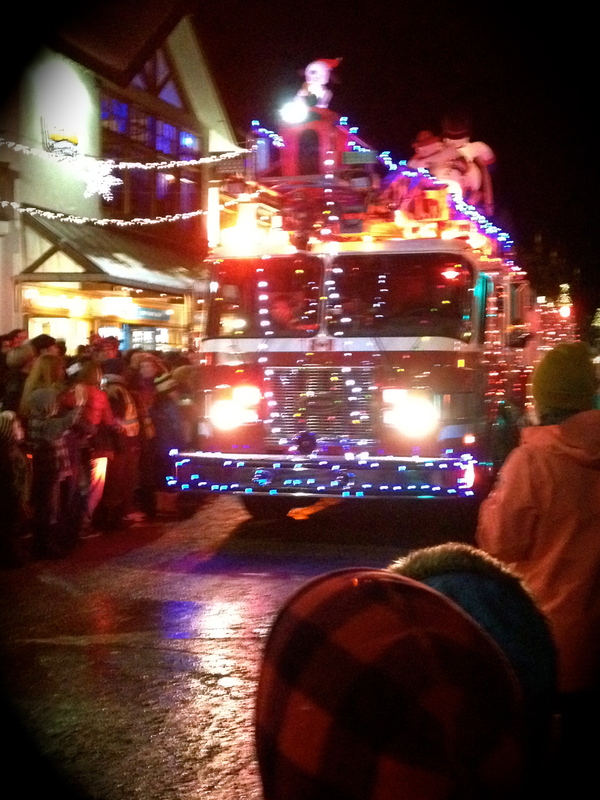 of Santa Parades – how fun would that be? We are already planning for Banff again next year, hoping to take full advantage of the day and all the activities they have to offer. We might even take the plunge and stay overnight! It creates such great memories an event that I hope every family has the opportunity to enjoy. 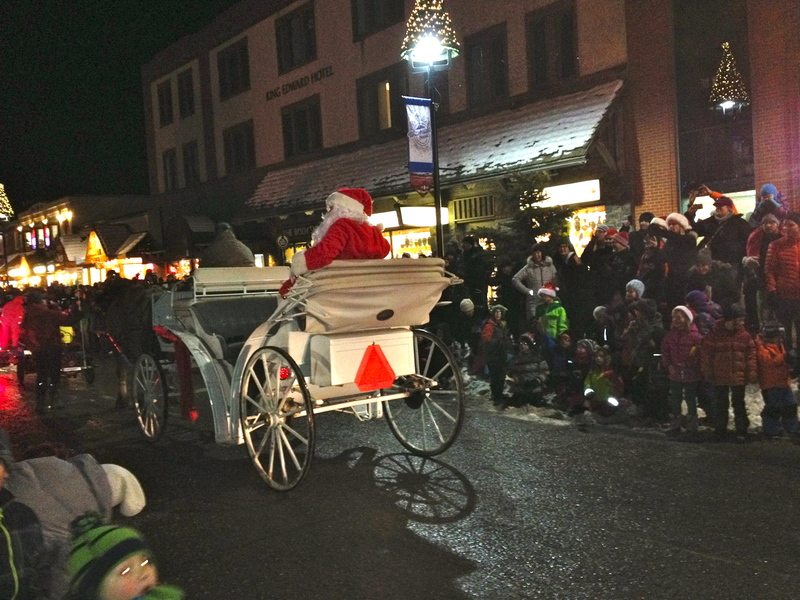 Have you attended a Santa Claus parade this year? Share with us your memories and experience. One of the many things that I love about Christmas are all the fun family activities that are on to attend during this season. From crafts to critters, there is something each weekend to choose from and you’ll never run out of fun things to do! Many of them are free, while some charge a small admission fee to get in. I love that many of them are also outside, which I think is a great way to get the kids outside and help the entire family enjoy winter! (cause let’s be honest sometimes winter is not so enjoyable). 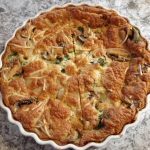 These events provide different ways for you to enjoy the holiday season, celebrating and demonstrating that there is more to Christmas than just gift giving – which I feel is important to teach the kids too. Held at the Calgary Zoo, view 1.5 million Christmas lights displayed in all shapes and forms, from animals to flowers. From late November to early January from 6 – 9 pm, children will be awed with the array of lights throughout the zoo. 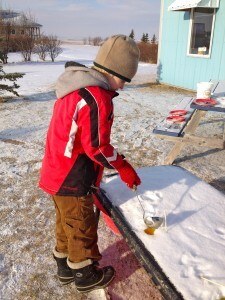 There are other activities for the kids as well such as snowman bowling, hay jumping (our favorite), as well as fire pits throughout to stop and warm up for a while. Hot chocolate is available for purchase, or bring a thermos of your own. There is an entrance fee for this event but it’s well worth it. This beautifully lighted Christmas Train rolls across Canada making stops along the way to the North Pole. It is a child’s dream come true as you watch the train pull into the station. 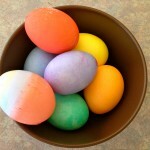 There are crafts for the kids as well as an outdoor concert. We went for the first time a few years ago (yes it was minus 30 and yes I think we are crazy) and my kids absolutely loved it! In fact it is the only thing that they are asking specifically to go to again this year (I guess the weather did not deter them). 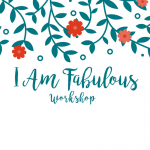 It is a free event and a very magical experience – check the website for your local schedule (attendees are encouraged to bring a non perishable food donation). 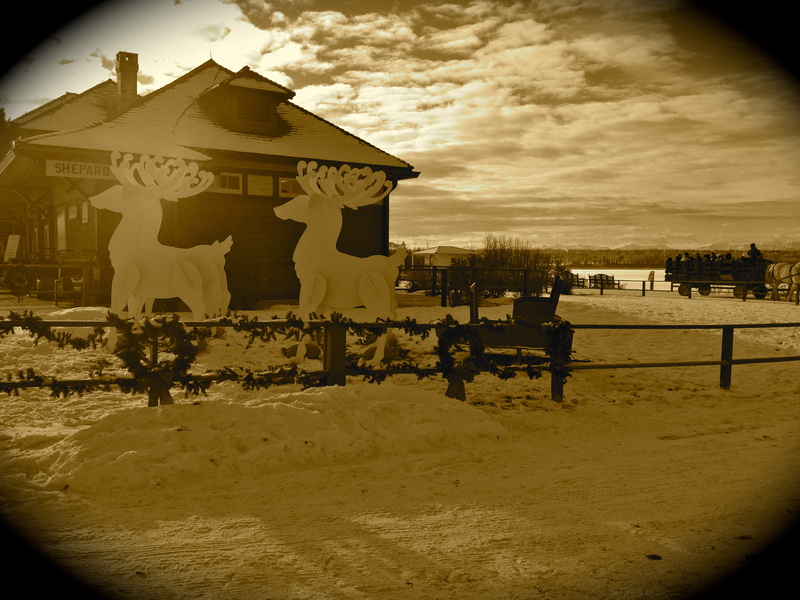 Enjoy an old fashioned Christmas at Heritage Park where you can enjoy a wagon ride, snow painting and a visit with Santa Claus. Shop the Heirloom Christmas Shoppe with unique finds at old fashioned prices! Children’s mazes, crafts and even a kids only store (that’s right no adults allowed) so your little ones can shop for you for Christmas. Our favorite here is the Christmas Train display, where you walk into a magical wonderland of model trains, zooming through Christmas villages and displays. Oh it is a sight to behold! My kids can spend hours in there watching the trains go round and round. Runs the 4 weekends before Christmas; there is paid admission to the park but you can find coupons at Safeway or First Calgary for discount on admission, which make it quite reasonable. This event takes you out of Calgary into the outlying areas of Okotoks. Hosted by the Chinook Honey Company this free family event includes making your own beeswax candles, honey toffee, visits with the donkey, a scavenger hunt and mead tasting. My kids love making candles in the snow and of course tasting all the honey! There is also a viewing area inside where kids can see the inner workings of an actual hive and try to find the queen bee. Just a short drive out of Calgary, this is a wonderful event that runs on Saturdays in early December starting at 10 am in a beautiful rural setting. Largest free drive by Christmas lights display, this 115,000 LED light display lights up Confederation Park. Set up completely by volunteers this light display will wow and awe everyone young and old. 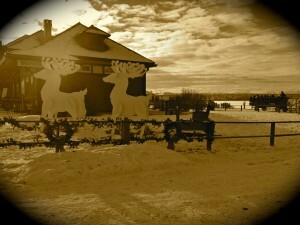 It can be seen along 14 St. NW, just south of 24 Ave. 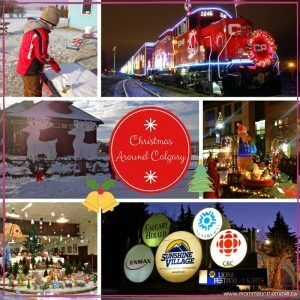 These are just a few of our favorite Christmas event in Calgary (and around). There are many others that we have not been to before that I would like to check out, like Christmas in Kensington, Christmas Skate at the Olympic Oval (Calgary Olympic Park), Christmas in Canmore; all a variety of crafts, music and activities and each a little bit different (Canmore is showing outdoor movies – super fun!). And new this year The Polar Express Train Ride! Can we say I am super excited about this one? There are also a number of community skates and events. Sadly, we do not have a Santa Claus Parade, which I really think should be reinstituted. Yes we used to have one, and I’ve been, way back before I had kids, my husband and I went. But apparently there has not been one in Calgary since 2007. Cochrane, Banff, Airdrie, and High River all have one, I think it’s time for Calgary to have one. But even without a Santa Claus parade, there are tons of activities to choose from. From outdoor events to theater – I love it! Because each weekend in December it is not what will we do this weekend? It is which event should we go to this weekend (thankfully some of these events are on during the week as well). Don’t get me wrong, we don’t run ourselves ragged getting to all the Christmas events. I am not a big believer in getting it all in until we are exhausted and never want to see anything Christmas again. 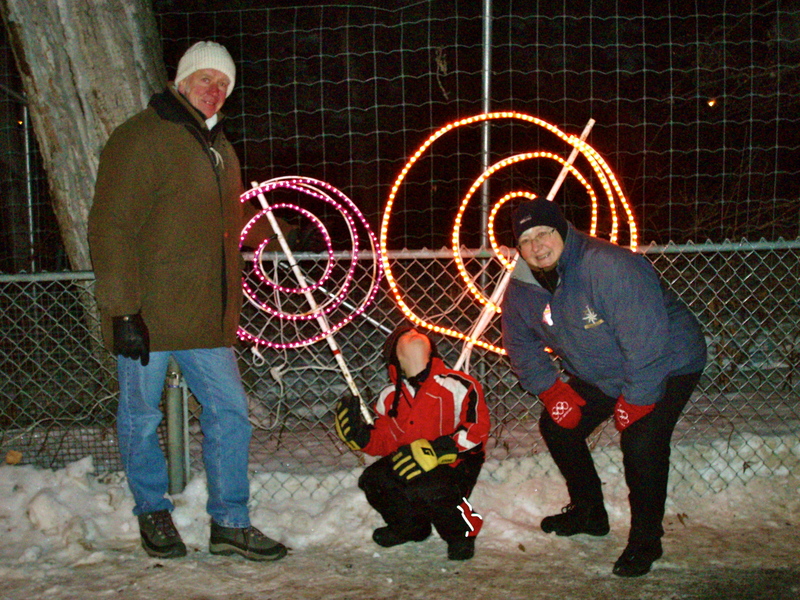 But it is nice to have the choice and variety to go out and enjoy our beautiful city, the season and our wonderful winter weather, creating more wonderful memories for years to come (even when it is -30C, cause yes we did that one year and that is the one that my children remember). 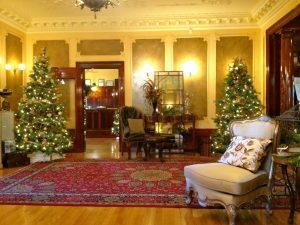 What are some favorite holiday/ Christmas events that you attend? One of the great things about children is that if you introduce things to them when they are little they usually just accept it. They approach everything with wonder and delight, curiousity and a willingness to try. 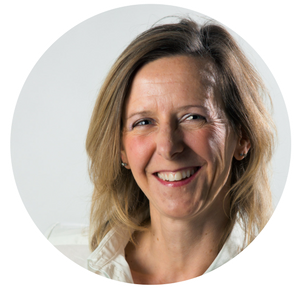 When you introduce it at a young age they do not have the fears or hang ups that we do as adults, the beliefs that we can’t or shouldn’t, or the stubborness to refuse what you are suggesting because they ‘don’t want to’. This is one of the beautys of being a child and spending time with a child. 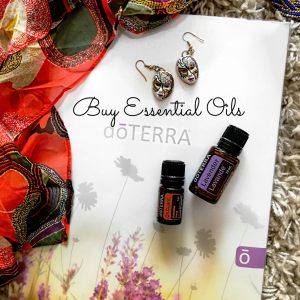 They remind us to try it all and to move forward fearlessly because you never know what joys you are going to experience. We have introduced things early on with all of our children, in many things, but specifically in introducing camping and hiking to them; all at around the age of 2. 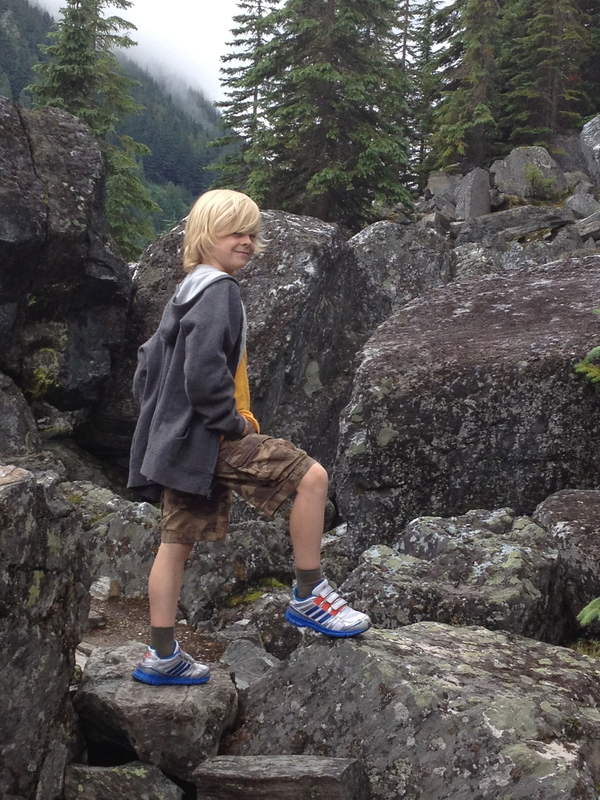 Matthew’s first hike was the Fenland Trail in Banff, a 2 km loop through a lush forested area. He completed it easily and then we did another short hike after lunch that day. I think he did 5 km total that day and he was only 2 or 3. 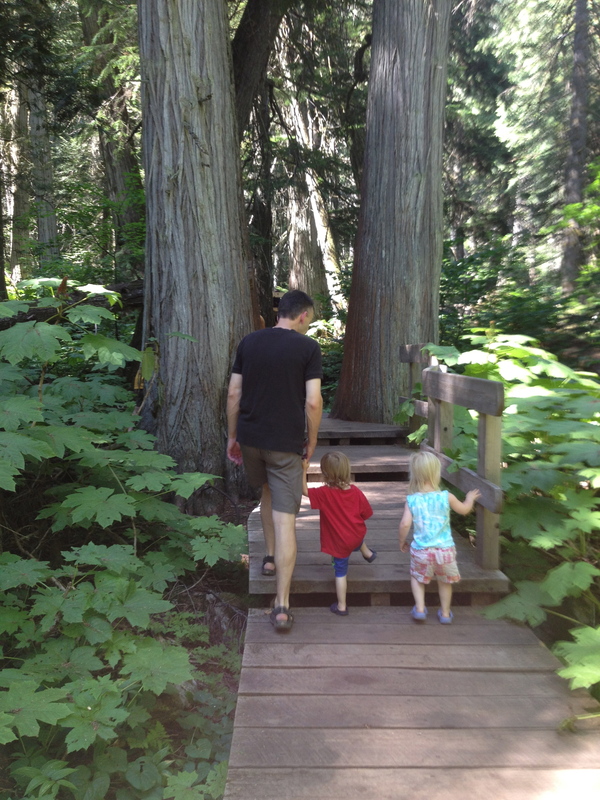 Luke and Chloe’s first hike was a few weeks ago on our way to visit my parents in Oliver, BC. 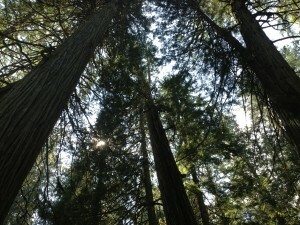 We had stopped for lunch at the Giant Cedars trail in Mt. Revelstoke National Park, British Columbia. 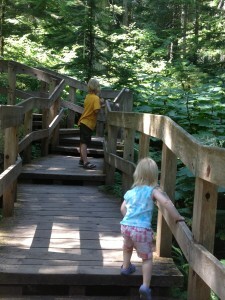 There was a picnic area and washrooms to use and after our tummies were full, we went for a walk along the trail. 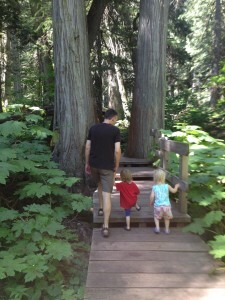 The Giant Cedars trail is an easy, self guided, 500 m loop with some of the oldest trees in the Columbia Mountains. 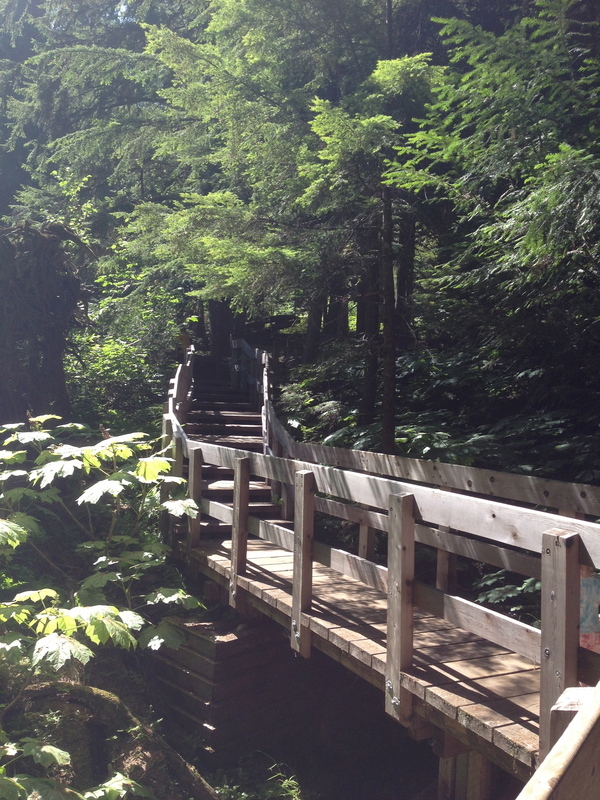 Featuring the largest western red cedars and dark brown western hemlocks, this boardwalk trail is lush, green and alive. 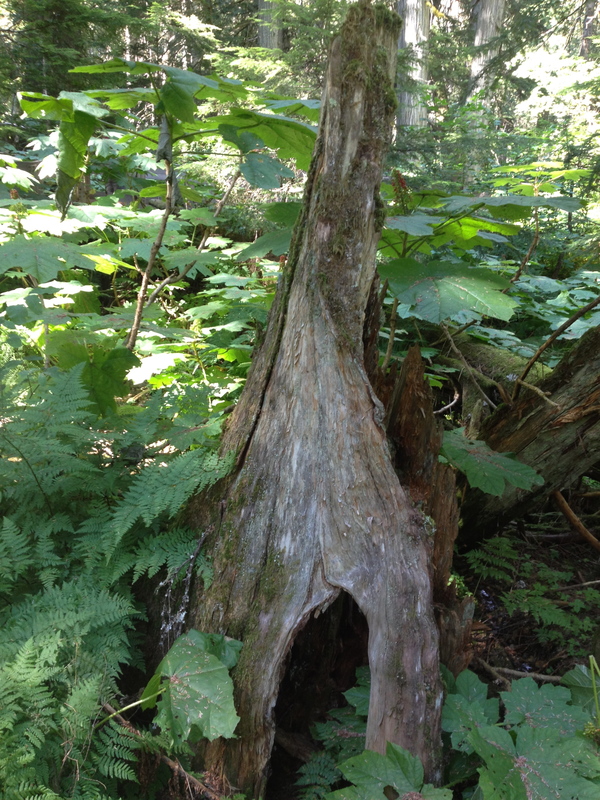 As soon as you enter the trail you can feel the warmth and comfort of a such an old forest. 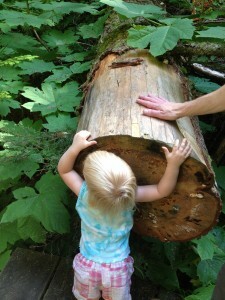 It is a great trail for kids with lots to discover and explore. There are benches along the way so you can sit and relax, enjoying the serene atmosphere and the magic of an old growth forest. 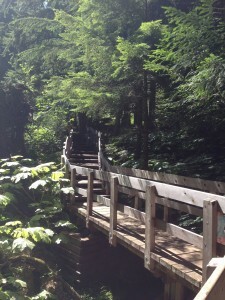 Both Chloe and Luke effortlessly went up the stairs that start the trail. Chloe was delighted by the little brook flowing by and would stop every time she saw water. She would scream in delight, “water!” and then bend over, hands on her thighs to take a closer look. We meandered along the trail checking things out, the Giant Devil’s Club, the nurse logs and fungi. We read the interpretive signs at different points along the trail describing the age of the trees (over 500 years old), the animals who live there, such as bats, bears and caribou; and how they all make up an important and healthy functioning ecosystem. Luke was very excited about the fairies which he shared were in their houses; which he told me were the splits in the trees or under the lush underbrush. Both Luke and Chloe walked the whole way, with Chloe stopping to hug and kiss trees and Luke checking out the flowers. Matthew of course ran the trail, cause as usual he had energy to burn. It took us half an hour to do the trail, but is typically done in 15-20 minutes, depending on how fast you move along the trail and if you stop to linger. It is a great place to relax and unplug for a while, to just sit and soak up the atmosphere. 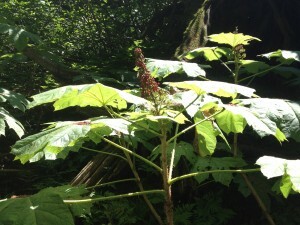 It is also a super easy hike for kids and will be a great first or early experience for them. 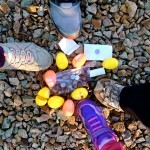 The key to hiking with kids to make their first experiences easy (short enough that they can walk it without feeling tired or have to be carried), achievable (something that they can do all by themselves without feeling discouraged at the end), interesting (lots of things to see, check out and explore) and in proper footwear. Now I would not run out and buy hiking boots for my 2 year old, but it is a good idea to ensure that they have sturdy, closed toed shoes, like runners. If you make their first experiences enjoyable and memorable than they will quickly and easily develop a love for hiking (and an appreciation for their natural environment) as they grow up. 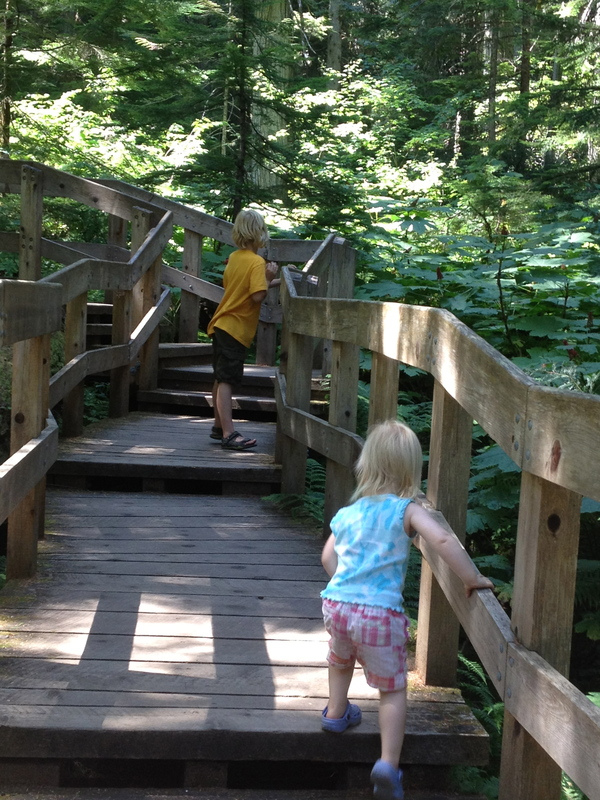 I’m always on the lookout for new trails to hike and explore with the kids. I love the outdoors and it is one of my greatest joys to share this passion and excitement with my children. For years we have been driving up and down the #1 highway west on our way to visit family or on some kind of adventure. I love this drive, it is a beautiful, lush and full of places to discover and explore. Often though we are pushing through to our destination or have another ‘planned stop’ and don’t always have the opportunity to stop at the trails and sites that I would like to see. There are 4 National Parks along this route, Banff, Yoho, Glacier and Mount Revelstoke. All are unique and beautiful in their own way with so much to do and explore. 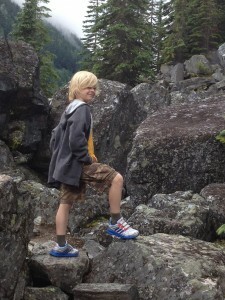 Ever since Matthew was little I have wanted to go on the Rockgarden trail. It is a short 20 minute hike on the east side of the Rogers Pass, in Glacier National Park. We discovered it one time when we stopped for a bathroom break and pulled into the parking lot for the outhouse. This trail though short is not meant for strollers or young children. If you have young children you will need a baby carrier to take them with you. 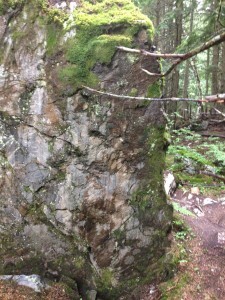 It is a steep, rocky trail with high drops in some places. 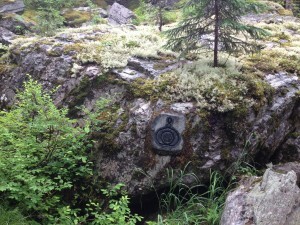 It has rock stairs and winds through boulders and lush forest. 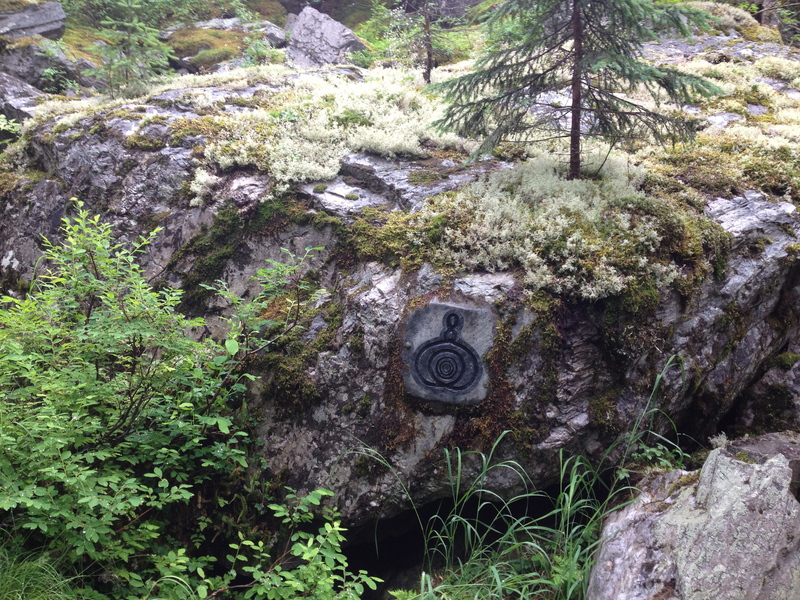 It is considered a miniature landscape all it’s own, rich in lichens and mosses that are more than 2000 years old. 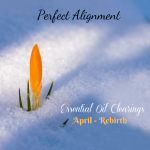 For one reason or another we have always passed it by, timing not working out with the kids, weather or the desire to push through and get to our destination. But this weekend we went! I was driving Matthew out to my parents for the week, and I had already decided before we left that this would be our planned stop. I was very excited that we were finally going! I kept my fingers crossed that the weather would be decent, as it was a little rainy. When Matthew and I entered the trail we were in awe of what we saw. 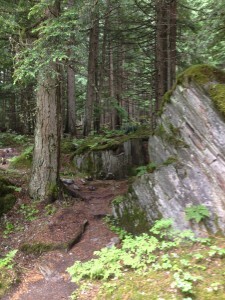 Piles of rocks/ boulders settled along the trail, part of the trail. It was truly entering a rock garden. At the beginning of the trail be sure to pick up a brochure that describes different areas of the trail by matching the symbols in the brochure. This provides you with more insight into what is/ has happened in the area and you can appreciate the wonder and life of the area. It is also a great educational tool for the kids! When I was little I always loved reading the signs and learning more. My parents would read the signs to us and as we grew we would read them on our own. Sometimes we would even set up a scavenger hunt using the signs and information and that was fun too! 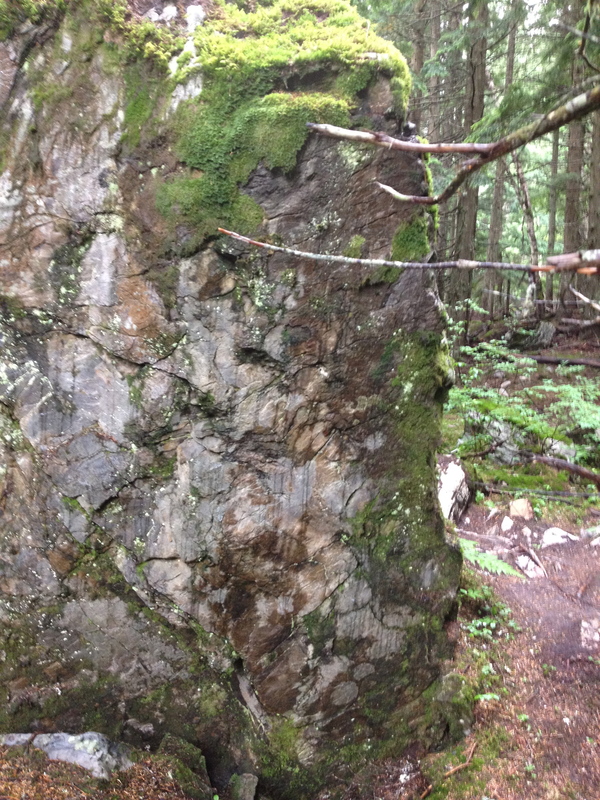 As we meandered and explored the rock garden we noticed the faces in the rocks and the energy of the forest. It is a magical place, one where you could sit and rest awhile before carrying on on your journey. So next time you’re heading down the #1 and need a break, or a chance to stretch your legs, I would highly recommend this beautiful and magical place tucked within the Canadian Rockies. Stop a while and take a breath, enjoy and discover a place you may not have noticed before.